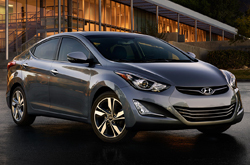 The new 2015 Hyundai Elantra expands on the award-winning 2014 design to provide new Hyundai shoppers unmatched value, performance and efficiency from an economy mid-size. With several styling updates to the exterior and interior cabin, all-new powertrains and class leading safety and technology features, the new 2015 Hyundai Elantra in Carrollton is sure to impress. Learn more as our 2015 Hyundai Elantra review continues below. With more front leg room than the Honda Civic or Toyota Corolla, the Elantra's intuitively designed interior delivers a quality feel without comparison. Constructed from environmentally friendly materials and designed to maximize user comfort, the new Elantra's premium interior amenities and passenger space highlights Hyundai's commitment to making vehicles with integrity. 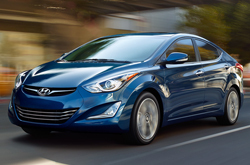 The 2015 Elantra's compact yet potent aluminum-forged engines offer impressive mileage and incredible power. Improved torque, lower emissions and better overall fuel economy from the lightweight 4-cylinder engines means more mileage and longer trips between pumps. The 6-speed transmission is also available with Active ECO mode, providing up to a 7% improvement in real-world fuel economy. The new 2015 Hyundai Elantra in Carrollton advances Hyundai's safety-focused legacy with six airbags including front, side-impact and side-curtains to help protect you and your precious cargo in the event of a collision. Additional crumple protection is provided by the innovative side impact reinforcement beams. Electronic brake-force distribution and Brake Assist on the standard anti-lock braking system improves control while stopping and provides maximum stopping force in cases of emergency braking. These features and more are why the new Elantra has been named an IIHS Top Safety Pick and earned a 5-Star Overall Safety Rating by the NHTSA. For additional details, features, available powertrains, trims and more, come test drive the 2015 Hyundai Elantra at Van Hyundai today. Our knowledgeable staff will help Elantra shoppers customize their new ride and get the most out of their drive time. Read more as our 2015 Hyundai Elantra review continues below with a detailed list of specs, a video walk around, comparisons and more. 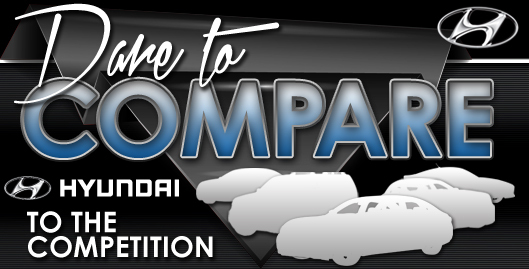 When you compare Hyundai's new 2015 Elantra to the 2015 Toyota Corolla, Ford Focus, Chevrolet Cruze, Nissan Sentra, Honda Civic and the Mazda3, we're sure you'll learn that the Elantra is perfectly built for you. If the Elantra's budget-friendly sticker price and passenger-oriented onboard technologies don't prove to you that it's the right vehicle for your needs, we're sure its eye-catching styling will seal the deal. Compare its price to the competition and you'll see that it's a truly amazing value, which is one of the main reasons why so many Dallas drivers select it. 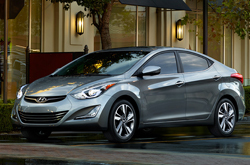 Look over the Elantra bullet list under this text for more quick facts. To make your car search less time consuming, Van Hyundai is happy to offer research tools like the 2015 Elantra review above, as well as reviews of past models. We are a well&$45;respected Hyundai retailer in Dallas, and it's our job to furnish you with reviews authored by some of the finest automotive writers in the industry. Jammed with up-to-the-minute information and specs, each summary gives you complete details about all the Elantra has to offer Dallas drivers in terms of mpg and much more. Thank you for viewing Van Hyundai's 2015 Elantra review. Now that you know more about the Elantra, use the contact form to message us to learn about exclusive offers and national incentives that can help you save significantly on your purchase.